It’s time for another installment of the Noble Grape Challenge. Last episode we explored the delicious world of Pinot Noirs, the lightest red wine on the spectrum. Today we take a step up in terms of body and meet our new friend, Grenache. Step up and meet Grenache! Grenache (aka Garnacha en Español) is grown mostly in Spain and France and is used more often in blends than on its own. In fact, I had a tough time finding a solely Grenache wine to do this tasting! I found lots of Grenache/Syrah and a fair bit of Grenache/Syrah/Mouvedre (good old GSMs! ), by far the two most common Grenache blends I come across. I actually quite like Grenache blends but wanted to isolate it for the purposes of the Challenge. Grenache wines are a step up from Pinot Noirs in terms of body, but is similar in colour, often looking quite red and ruby-ish. Common flavours include strawberry and cherry and can be a good introduction to tannin – the thing in wine that makes your mouth pucker and leaves it feeling dry – because it has some but not so much that it would be off-putting to a newbie. As far as what to drink it with goes, I would pair it with anything you would have candied strawberries or cherries with. To try out Grenache I tasted Beso de Vino Old Vine Garnacha. It certainly looks like a Grenache, I can actually see the design of my curtains through the wine! My novice nose smells cherries and something else with some weight or earthiness that I can’t name. The flavour is definitely a step up in terms of body from our old friend Pinot Noir, and I definitely taste those mouth-puckering tannins, though not as strong as I’ve tasted in other wines. I also taste a bit of cherry, but find it a bit tough to get to other flavours because of the tannins. It seems representative of the Grenache varietal, but I think the flavour could be more well balanced. A decent if not truly satisfying buy. 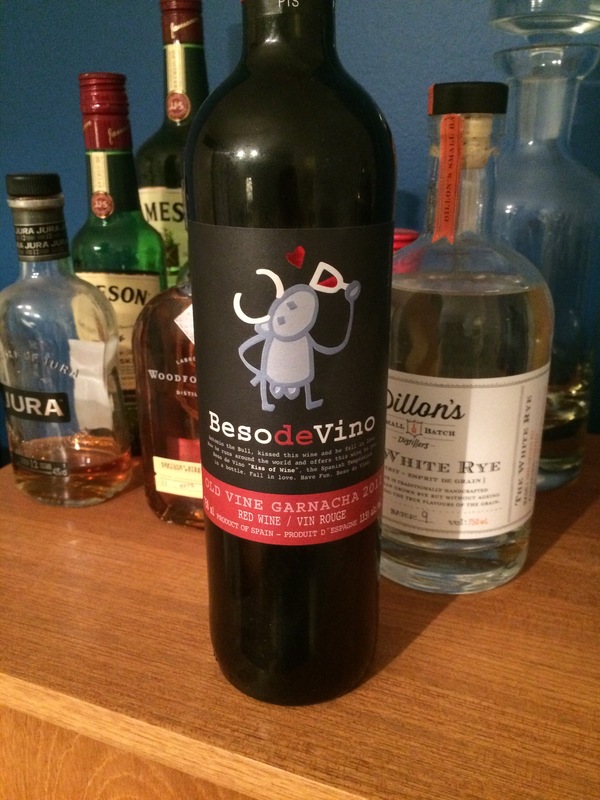 Have you tried the Beso de Vino Old Vine Garnacha? What did you think of it?